Malcolm Dawson writes……..are you a glass half full or glass half empty type of personality? This was one of those games where the moaners and complainers will point to the fact that we have only won one of our last five games while those of a more upbeat persona will point to the fact that after nine games we have only lost once and are still near the top of the table. Some will point to the fact that in that time we have only kept one clean sheet while others will say we have never failed to score. Some observers will acknowledge the fact that two injuries in the first half, meant Jack Ross could do little to change the shape of the team or bring on players who could offer a different type of threat, but there will be those who will question the manager’s picks in the first place and focus on perceived weaknesses in others. Stewart Donald was sitting in with the 5,000 Sunderland followers at the Ricoh yesterday and television close ups showed him sitting impassively whilst those around him were animated. It was difficult to know what he was thinking but not so Pete Sixsmith, who was also in the crowd. Here’s what he thought of his day out in the sunshine. Legend has it that Lady Godiva rode naked through the streets of Coventry on a white horse to shame her husband into reducing taxes on the peasantry – or some such guff. Legend also has it that Sunderland do not win games in this corner of Warwickshire. Twenty-three visits over the years have yielded but 3 wins – an FA Cup win in 1930 and league triumphs in 1976 and 2001. Defeats have been the order of the day, so a draw at a ground that we traditionally do badly on is surely some cause for muted celebration. Well, up to a point it is. We did not lose. We dug in well after losing defenders to injury early on. We scored a good goal. All of these were positive points that we could take away from this rugby union stadium with a football club attached and hope that this is the point that ensures our occupation of positions one or two come May. On the other hand, there were negatives to take back along the M69 and M1. There was some shaky defending, particularly in the second half, when City should have gone ahead. We failed to impose ourselves on the game after opening the scoring and building on the excellent goal we scored. Some of our support is not fit for purpose. Let’s deal with the positives first. Losing Loovens after four minutes disrupted the original selection. Flanagan moved into the middle and Matthews took the right back role without seriously weakening the team. The drawback was that that there was one sub used already, reducing the possibilities of unleashing McGeady, Sinclair or Power in the second half. When Hume went down with an injury on the half hour and eventually limped off to be replaced by Oviedo, we were left with just the one tactical change, assuming nobody else was affected by strains and pulls. Oviedo for Hume was a good exchange and the former Everton man gave us more poise and balance and should be playing for the foreseeable future. To describe the first half as dismal fails to do justice to that word. Sky TV had no Premier League games to show on this day (BT had bagged them) and viewing figures away from the North East must have plummeted as casual viewers almost certainly preferred to watch the Manchester United car crash than an anonymous third level game being played in a half empty stadium – a stadium that would have been two thirds empty had Wycombe, Southend or Doncaster been the visitors. Maguire – unlucky with the free kick. Chris Maguire had hit the post from a free kick with George Honeyman failing to convert the rebound while City failed to launch one decent attack in the opening 45 minutes on a glorious autumn afternoon. The second half was a vast improvement and probably saved Sky’s viewing figures from plummeting into double figures. There was a greater urgency about both teams as they woke up and realised that there was a game to win. We struck first after a fine move down the right which ended with the goal scoring machine that is Lee Cattermole tucking away a good cross from Matthews. That gave us a base to build on and, had we had a full complement of subs to use, it would have meant that a couple of astute tactical replacements would have kept City on the back foot. As it was, they shook themselves, seized the initiative and pushed us back. Power replaced McGeouch in order to strengthen the middle areas but within two minutes the dangerous and competent Jonson Clarke-Harris had stroked home a well worked equaliser, setting up a hectic final 20 minutes. Oviedo and Honeyman both had shots well saved by Burge as we looked for the winner but City had the best chance in the last minute. A long ball was played through, Flanagan failed to control it and the busy Chaplin bore down on McLaughlin’s goal. The keeper took the sting off his shot, but it looked as if it were rolling into the net when, in a puff of smoke that was reminiscent of a David Nixon illusion, Jack Baldwin appeared and managed to hoof the ball away. There were sighs of relief all round the South Stand and howls of anguish from the other two occupied parts of the stadium. In the end, it was a fair result and neither sets of supporters could quibble about it. Not that that stopped some of ours. George Honeyman and Josh Maja came in for the most stick, probably because they have come up through the ranks. Neither had particularly good games with the former giving the ball away far too easily and the latter not relishing the physical side of a game like this. Both have repaid the faith that the manager has shown in them and neither are anywhere near being left out of the team but the abuse that is heaped on them by some of the support is out of proportion. Is it because Honeyman is a local who has been with Sunderland since he was a bairn? Is there an underlying element of racist attitude behind the criticism of Maja? There are some in our crowd who seek to isolate and bully players for reasons as basic as this – Jordan Henderson received fearful stick in his early days and Darren Bent’s mother was abused at Wigan, so we have previous. Taking 5,000 to a game 200 miles away that kicks off at lunchtime is impressive and would be more so if some of the support did not see this as an opportunity to get wrecked on drink and whatever else some use to heighten their senses. People in front of me missed the goal because they were having a drink in the concourse – what comes first, football or a pint of overpriced, over chilled lager in a heaving mass of humanity milling around a dark and gloomy shed? The lager won in this case. What about the behaviour of the man who got off the coach at Ferrybridge Services and began to urinate in full public view despite there being a toilet 50 yards from where they had parked? What about the pathetic skirmishing after the game which held up the departure of all 31 coaches and did nothing for the reputation of Sunderland AFC and its supporters. We even had unpleasantness on our coach on the way home due to excess alcohol and anger management issues that could lead to some of the regulars looking for alternative means of transportation or not going away at all. It wasn’t the greatest day out. Up before 5.30, on the road by 6.45 and home for 7. 00pm meant a long day after a late night on Friday. That had been spent at another rugby ground, Headingley, where I had seen the worst Leeds display of a wretched season as they went down 16-17 to Toronto in a game that ensured Super League survival for Leeds and gave Toronto every chance of joining them next season. 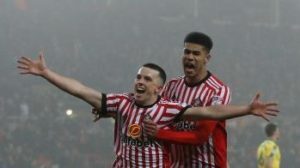 The Leeds performance reminded me of Sunderland teams of the past few years – talented individuals failing to do simple things effectively and making life very difficult for themselves. This team needs to avoid falling into that trap. We have a good squad for Division Three and need to focus on doing the simple things right. And some of the support needs to remember that we have no right to treat this league with disdain. We are there for a reason. 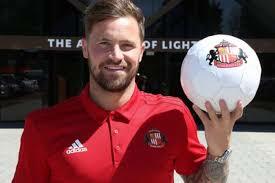 Cattermole – are those demanding he be dropped at the start of the season now eating their words? 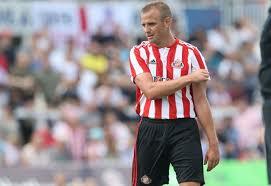 Cattermole, who had a good game, misses Tuesday because of suspension so Power should be an ideal replacement. Should Gooch be unfit, McGeady will be a likely candidate to run down the wing while Sinclair could come in as a second forward. I doubt if Loovens or Hume will be ready so Matthews and Oviedo should continue. Flanagan struggled at times in this game and needs to concentrate carefully. Peterborough United will provide a tough test on Tuesday. Their away form is excellent, having won all 5 games on the road. Now would be a good time to inflict that first defeat. If there is any copyright claim, not answered by ‘fair use’ exemptions on the images used to illustrate this report, please make us aware and we will add credits or remove as requested. I enjoyed the match in a Washington pub joined by a double decker bus full of Leicester fans who left at half time for some reason. Very sad to hear of the bullying of two of our own; I haven’t actually heard any abuse at the home games around my seat – the atmosphere has been pretty positive, but it might not be long. We do have previous – Henderson, Oster come to mind, and Kilbane, skilful, always a tryer and seems a nice lad to boot, if that counts for anything. Don’t know where the answer lies in solving this problem, but calling it out is a start. It is very disappointing to read of the behaviour of some of our ? fans. I sometimes wonder if many of these people have ever played football? Does anyone actually think that verbally abusing players improves their performance, or their motivation? We do not have a divine right to win. It is 11 v 11 and they want to win as much as we do. Our opponents spend the week training and working on tactics, just as we do. It will take time to get Sunderland back into the big time again. It simply will not happen overnight. Our massive support, in this division, should work as a 12th man – but wrongly applied it can be really detrimental. There are some people who are only too happy to look for something or somebody to criticise and will jump on any bandwagon going, with little to back up their opinions. Honeyman had a good shot saved by their keeper yesterday. It could easily have gone in then he would have been a hero in the eyes of those same people. Flanagan slipped and it almost cost us a goal. Is he about to get the same treatment that Ozturk got after the Charlton game? I hope not and I hope that when brought back into the side Ozturk will respond in the same way as Cattermole did and prove his worth. What is obvious, what the manager and players have said since before the season started, is that we are going to need the whole squad this season and it will serve no purpose getting on the backs of individuals. Power, McGeady, and Oviedo can all be like for like replacements for those who started on Saturday who won’t be available for Tuesday and either Matthews will start with Flanagan in the middle or Ozturk will come into a back three. Loovens reads the game well and can organise the back line and will be missed. I wonder if those who describe him as a sick note are looking forward to Watmore’s return to the side. 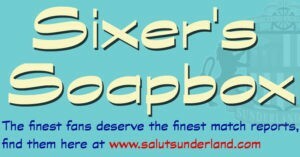 Sadly SAFC supporters have this NE disease of bullying their own players. Its nothing new, even legends like Bobby Kerr received abuse pre-73 cup final. And I remember sitting with a “friend” who repeatadly told me how atrocious Jordan Henderson was – I thought he was MOTM!!! Here we have a similar issue with Honeyman, who performs a similar role and as mentioned could easily had a brace v Coventry. It seems we continue to have a minority of vociferous SAFC supporters who are thick, don’t understand football and turn up so pissed at games that they have to read social media afterwards to find out what happened. No wonder they are twisted. You are correct when you talk about those not understanding the game. Seb Larsson was another who used to get criticised because he wasn’t always flamboyant. What these types can’t see is how players like Honeyman will take up positions off the ball to close down passing channels, will force opponents into less dangerous positions, to lessen the attacking threat etc. You don’t always need a crunching Cattermole type tackle to thwart an attack. Incidentally, if Cattermole was booked for dissent then that was pretty stupid of him knowing he was on 4 yellow cards. He got away with one dubious tackle but to my eyes it looked like it was because he was remonstrating with the ref that he got booked. Thought he’d grown out of that. I thought Matthews showed a bit of indecision just before they scored, allowing the cross to come in. He might not have been able to stop the cross but he seemed to give their player just a half second and half yard extra to pick out his pass. Well done Peter and others for speaking up about abuse of our own. It’s a pity these well thought out comments won’t be read by the guilty ones.